Yarm Library’s recent refurbishment is the last of our town centre “main library” developments following the adoption of a hub and spoke approach by Stockton Borough Council in 2011. The High Street location of the building means it is a prime site not only for us, but also for potential partners. In 2014 we were approached by Newcastle Building Society who were looking for potential co-location sites for small branches in areas which weren’t served by a main branch. 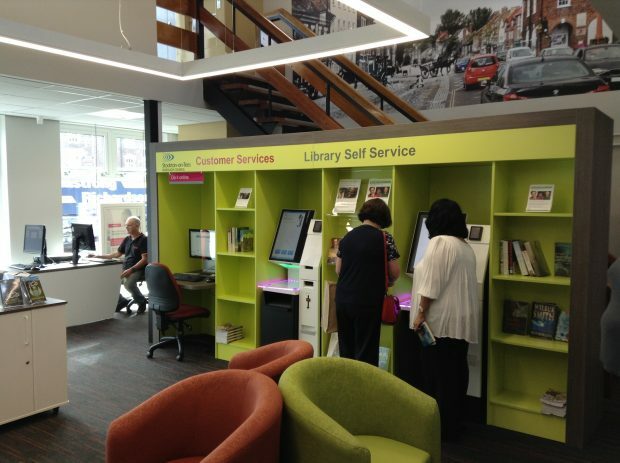 In Stockton, we already have experience of co-locating our libraries, with three sitting alongside customer service centres, one with a town council and two with Children’s Centres. We were keen to look for other opportunities and a co-location with a community focused mutual such as a Building Society fitted well with our strategy. We looked at two separate locations but eventually the project focused on the library in Yarm where a small meeting room space could be re-utilised to accommodate the Building Society whilst the library, which was already due for refurbishment as part of our ongoing scheme, could be made more flexible to allow groups to use the main space. The process has taken us two years to realise and it has been an interesting project to work on. As expected, the co-location of a financial operation such as a building society does provide its challenges but these were not insurmountable and the relationship we developed with Newcastle Building Society’s team helped us through. The library is a 1960’s former North Riding County branch library and had not been fully refurbished since its opening. We were faced with the task of modernising the space to provide a new entrance with an integrated ramped approach for people using wheelchairs, the complete re-equipping of the library and the installation of RFID self issue. 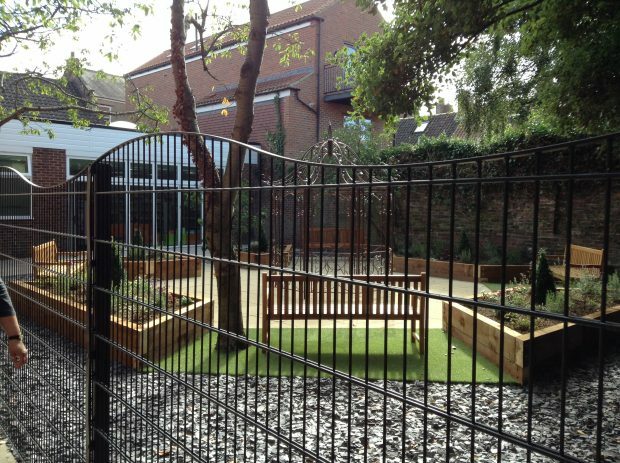 At the rear of the library, an enclosed garden area had never really been fully utilised. 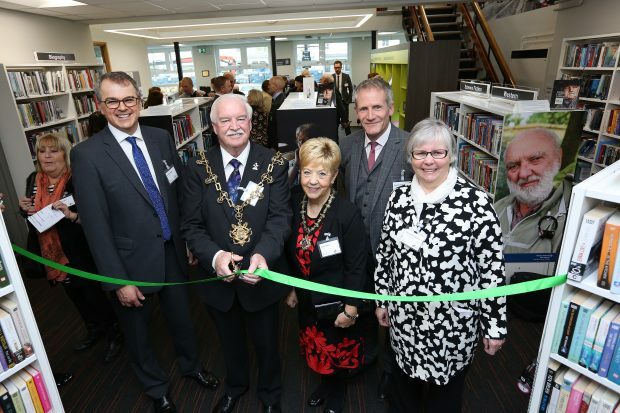 Following a closure of several months, in September we were able to open a full integrated new space with a small branch of the building society, a new accessible “reading garden” and a fully accessible new library space. The NBS team have their own office space and dedicated building society facilities but share the staff facilities with the libraries team. They have quickly become “part of the family” and most recently many of them took part in the Northern Children’s Book Festival as volunteers. Our audiences have been very appreciative of the new arrangements and both the library and the Building Society have been very impressed with the way the two operations have complemented each other. We always imagined that bringing two audiences together would provide new customers for both and certainly, the Building Society in particular has reported many new accounts since the new branch opened in the library. Issues and visits to the library have risen sharply. The partnership has brought the advantage of shared marketing, teams working in tandem on events and a really interesting, developing relationship between libraries and the Building Society. I know that other services are now looking at this model which can bring in an element of income but also provides a productive relationship. “It’s all about people and the relationship that the Building Society have with their community. We are hoping that the new arrangement is a win-win for everyone, encouraging more people to visit the library and also enabling us to better help customers in a friendly environment." And our customers have been very supportive too… these are just a few of their comments. Very impressed with the face lift. Light, airy and very welcoming. We adore the children’s area great collection and so comfy! Garden is super – spacious, well laid out. Relaxing place to read in fine weather! New children’s area lovely. Well I think everything is just wonderful!!! Not only have we kept our library but it’s all new as well! To keep up to date with activities in Stockton’s libraries, follow them on twitter. We're not customers, we're the public. Libraries don't belong in commerce and commerce doesn't belong in libraries. This move is a mistake and future years will show how costly it was.